Many social events are organised throughout the year – please see the noticeboard in the clubhouse for posters. Members sometimes organise events themselves - so if you fancy organising a themed dinner party or disco, don't hesitate to contact one of the Social Committee. Trophy presentations – full details of the evening can be found in Latest News. June Solstice – a wide variety of events over the weekend occurring in mid-June. 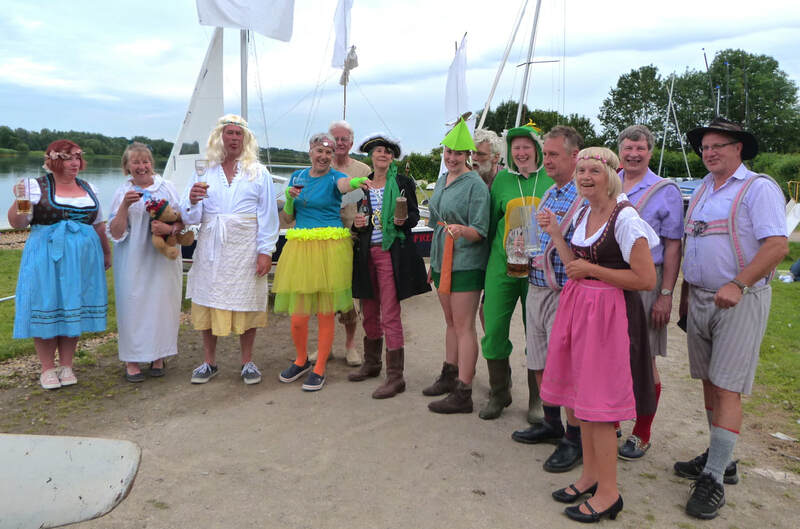 Includes Social Sailing all day, Buccaneers & Youth sailing, Match Racing, Night Race and Fancy dress parade. Safety boat cover from 10h00 to midnight. The night race is for teams of 4-6. Junior Sailing Week – once a year, usually early in August, the club runs an event whereby we offer to take members’ children off their hands for five whole days! At a cost which doesn’t break the bank, we offer youngsters between 7 and 14 an opportunity to pitch up and just muck about on the water. All activities – which may range from raft building, through circus skills and team-building games, together with boat familiarisation and lots of sailing – are fully supervised with an adult:child ratio of better than 1:2. Our aim is to send children back home able, at the least, to sail a triangular course, totally exhausted and with huge grins on their faces. We’ve yet to fail! Half Crown Club – meets every Wednesday afternoon, come hell or high water! OK, we don't always sail, but if the weather is 'orrible we drink lots of tea and swap war stories. Sailing needn't necessarily be about competitive racing, so it's good sometimes just to get out and muck about on the water with like minded people. So what's with the 'half crown' business then? Well, if you are old enough to remember one then you are one of us. Seriously though, anybody who is free to come out and play on a Wednesday afternoon is very welcome – not just the old fogeys! 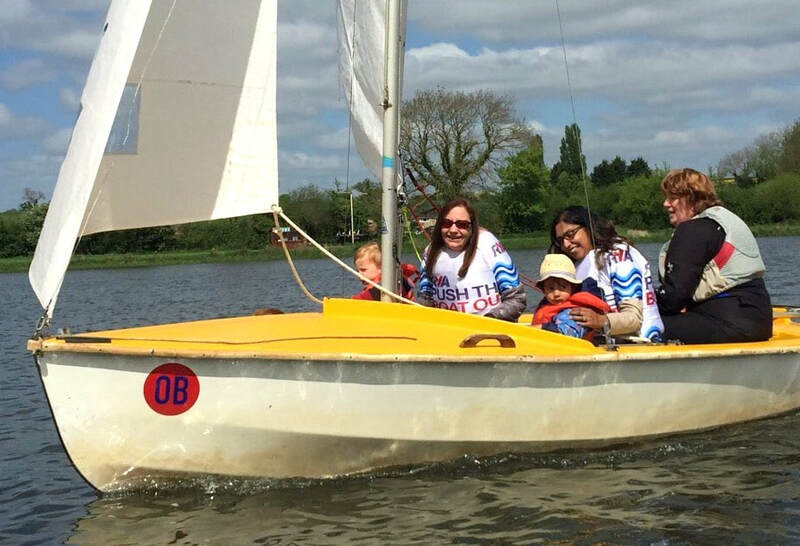 Push the Boat Out day – is a RYA national initiative. The club usually have demonstrator boats available to sail and, weather permitting, club Instructors and experienced helms available to take visitors out onto the water, whatever your age. The day usually coincides with the club Open Day in early May. So come along to discover the facilities that we have available, the courses we offer, the full scope of our social activities, how our recreational and racing sailing programmes operate and learn why so many people make Haversham Sailing Club the centre of their sporting and social life. Have a look at a YouTube video. Bart's Bash – launched in 2014, is the world’s largest sailing event that is run by sailing clubs, community sailing programmes, sail training centres, yacht clubs, scout groups, sea cadets and groups of sailors, all around the world. Bart’s Bash is an exciting event for the Andrew Simpson Foundation and the worldwide sailing community. Quiz nights – held on Friday evenings during the spring and autumn. Bonfire night – on or around nearest Friday or Saturday to November 5th. Your entrance fee is a large firework per family. Bar-B-Q with sausages etc even if it rains! Christmas parties – pretty informal and lots of fun around the Christmas period. Father Christmas usually stops off at the Buccaneers' event. Always keep an eye on the Calendar and Latest News for dates and details.